An Email Service Provider, that is! Not to be confused with who you get your Internet service from, an Internet Service Provider, or ISP. Make sure you have those two straight, since both come into play in this discussion. ESPs do the tech back end portions of your list hosting: they keep track of who asks to subscribe to your list(s) — or, as the case may be, unsubscribe — and much, much more importantly, they do the actual sending of the mail for you, whether it’s to a list of 5 people, or 5 million. They have the infrastructure to make it happen so that you’re not having to maintain servers, or software residing on servers. If you really only have 5 subscribers, you probably don’t need an ESP to help you — unless you have any interest in growing that list, which means growing your business. Since you’re here to learn about this, I’ll assume you want to grow. The absolute best thing to do in that case is start with an ESP, rather than wait until things are out of hand. 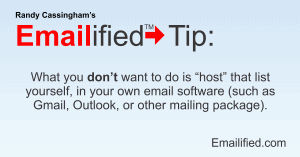 What you don’t want to do is “host” that list yourself, in your own email software (such as Gmail, Outlook, or other mailing package). Gmail, for instance, limits your messages to delivery to 100 people per message, and 500 message recipients in a day; that might be more than enough to send a few jokes to your friends, but 100 isn’t much of a business base! And if you break the 500/day limit, Google shuts down your account for the day. Outlook (the software) might be able to handle more than that, but you still have to depend on your ISP to handle the outgoing mail, and your ISP could have similar limits, and may well shut you down if you seem to be sending a “suspicious” amount of mail: the first step in being branded a spammer. Even if they don’t shut you down, it’s quite likely ISPs will “throttle” the speed of your outgoing mail once you reach certain thresholds, slowing down acceptance or delivery. And that’s reasonable: they’re not in the business of distributing huge volumes of email. But ESPs are: they understand the concept of needing to send a lot of mail, and will send the messages on your behalf without your having to worry about limits. A good one will ensure you adhere to Best Practices by verifying that the folks on your list actually asked to be there, and will be receptive to receiving your messages. When I first started in 1994, there was no such thing as an ESP. I had to learn a bunch of Unix commands and other tech to get my newsletter out, because it grew very quickly: it broke 10,000 subscribers just 11 weeks after launch, and the Unix sendmail program (the back end mailer at the server level) broke down after 9,999 recipients. I knew enough tech to know how to get my way around that problem, but it was a pain, and time-consuming. Early on, I was one of the first customers of what was probably the first ESP, and I no longer had to use work-arounds to get my messages out. Now there are scores of ESPs, so which one is best? (You may have already figured it out, if you were paying close attention when you subscribed to Emailified’s mailing list.) Naturally, I’ve looked at scores of ESPs and, more importantly, their reputations before deciding who to use, and who I use is AWeber. The basics of sending large amounts of mail was solved long ago, so naturally there are a lot of ESPs out there. What makes one better than another? Certainly, speed is important, but with powerful servers and fiber optic broadband connections, that’s not a big factor anymore. What is? What I said above: reputation. If you were AOL, and there were 200 different companies all saying they are going to be sending huge amounts of mail to your customers, you’d be wary: already, about 80 percent of all email is spam — it’s a huge resource problem for every ISP. You have to sort through all that garbage and work to weed out the spam that your customers absolutely don’t want …and make sure they get the legitimate mail they do want. So when XYZ ESP comes to you and says “We have mail your customers want — really!” you might be a tad concerned, and you’d have a right to be. This is where reputation comes in, and AWeber’s is the best in the business, in my opinion. They also have a terrific feature set, are still adding more features and capabilities (they’re not coasting, they’re innovating), and their price is reasonable — a big deal if you’re just starting out. What that all adds up to is something that’s dramatically important: “deliverability” — the ability to work with ISPs to assure them that yes, their customers really did sign up to get the mails that they’re delivering for you. Not all ESPs are trusted, but as far as I can tell, AWeber is considered one of the most trustworthy ESPs, meaning the mail you send through them is much more likely to get through to your subscribers. I trust you see how vitally important that is! Some ESPs will take on nearly any customer, and some of those customers might not be (shall we say) totally ethical. They may have big lists of “subscribers” that they gathered up, but did those people all really ask to subscribe to that specific list? Often not. No doubt you’ve been “subscribed” to many lists against your will: irritating, isn’t it? The best ESPs can be choosy: they’re not so desperate for customers that they’ll take on “just anyone” and import their lists, no questions asked. That’s the kind of ESP I want for my mail. So when people ask me what ESP they should use, AWeber is my top answer, every time. Tell them Randy Cassingham sent you. 2 Responses to Do You Have ESP? Thanks! I did a year ago, on yours and Leo’s advice. My only complaint is setting the newsletter can be complicated. It jumps around and is slow to update. But this could be operator error! I’m not the best! I’m not sure I understand the issue, but send me details privately and I’ll see if it’s something I can cover in an upcoming article, or training.